Accurate measurement of the small pre-failure deformation plays a crucial role in landslide early warning systems. Recently, terrestrial laser scanning (TLS) has been applied to detect the small pre-failure deformation, while the processing of TLS point clouds is still a non-trivial issue, especially for long-range TLS. Therefore, we propose an efficient method to detect the small pre-failure deformation of slow-moving landslides by the use of long-range TLS. To precisely align the point clouds of different epochs, a hybrid-weighted iterative closest point (HWICP) algorithm is proposed after the coarse registration, where the influences of several factors (i.e., deformed areas, point density variations, and observation errors) on the inconsistency of the point correspondence are quantitatively estimated. An adaptive local cloud-to-mesh method (ALC2M) is then proposed for the deformation calculation in the complex topography by defining a local reference frame and removing poor matches between ground points of the two epochs. To validate the performance of the proposed method, the Dashu landslide of the Three Gorges Reservoir Region was selected as a case study. 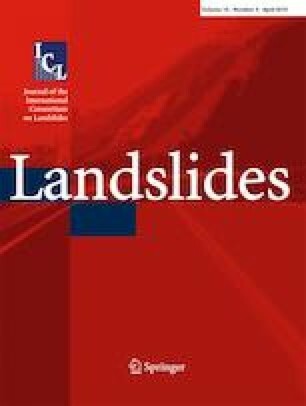 The TLS-derived deformation showed that the landslide was stable in most areas over the study period, except for two abnormal deformation zones with maximum deformations of ~ 6 cm and ~ 3 cm, which agreed well with the ground-based synthetic aperture radar interferometry (GB-InSAR) measurements. A statistical analysis of the stable areas around the landslide illustrated a low uncertainty for the TLS-derived deformation of 6.3 mm. Therefore, the use of the long-range TLS was an efficient way to monitor slow-moving landslides. Moreover, extensive comparative experiments about the co-registration and deformation calculation were conducted, and the results showed that HWICP and ALC2M achieved superior performances. The authors are thankful to anonymous reviewers for their valuable comments. Special thanks to Lin Liu, Yafei Sun, Binbin Gao of Institute of Geodesy and Geophysics and Daqing Ge, Bin Liu of China Aero Geophysical Survey and Remote Sensing Center for Land and Resources, since their works in capturing the experiment datasets. This study was jointly supported by the National Key R&D Program of China (Nos. 2018YFC1406102 and 2017YFA0603103); the China Postdoctoral Science Found (No. 2017M622553); the NSFC project (Nos. 41801398, 41590854, 41531177, 41701530); and the Key Research Program of Frontier Sciences, CAS (Nos. QYZDB-SSW-DQC027, QYZDJ-SSW-DQC042).